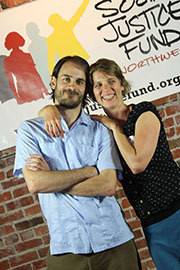 Last week, I started as the Development Director here at Social Justice Fund NW. It’s an extraordinary political moment to be stepping into this movement role, the perfect culmination of the organizing work I’ve done over the past 15 years. At the annual dinner in October I told some SJF members about my new job, and the hugs, high-fives, and exclamations of support I received were overwhelming. Ever since I first sang karaoke with the board and staff back in 2012 I knew that SJF would become my political home, as well as where my partner Krista and I make our largest gift each year. As I embark on the next phase of my journey with Social Justice Fund, I ask you to join me by making a gift before December 31st to ensure this important work continues. Though I’m new to the SJF staff, I’ve been around this family for a while. I grew up in Seattle and moved back here five years ago, joining the SJF board at that time. I believe strongly in the need to build the confidence and motivation of donors to step up their commitment to grassroots movements, and I’ve been a donor organizer myself for years — from my work as Executive Director of the Committee in Solidarity with the People of El Salvador, to my involvement with the national organization Resource Generation. Finding Resource Generation was the catalyst for deepening my own commitment to philanthropy and encouraging my parents to join me in opening a donor-advised fund, which expanded our collective giving to progressive groups doing community organizing. In 2013, I asked my dad to be part of the Economic Justice Giving Project with me, and our participation was a model for SJF launching two new Intergenerational Giving Projects in 2017. Looking ahead, I find courage in the fact that the groups funded by Social Justice Fund NW will be on the frontlines of resistance against the resurgent far-right, while also continuing to build positive, progressive alternatives at the local level. These organizations will play a bigger role than ever in protecting our communities. We must move resources to them to keep them strong and resilient. I feel humbled and inspired that, in this historic moment, I get to work with amazing people like you to raise money for the core mission of Social Justice Fund. If we stand together, we won’t just survive, we’ll grow stronger, and we’ll win. Please make a donation today to strengthen our work in 2017.